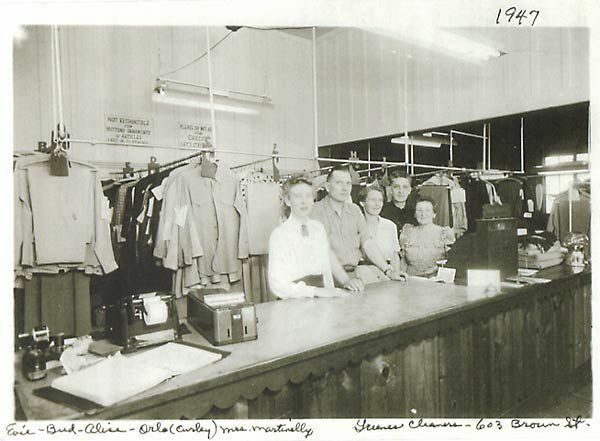 Greene's Cleaners store and staff in 1947. Owners Laurie and Alonso Corona. An early advertising poster for Greene's Cleaners. Greene’s Cleaners, the venerable dry-cleaning company in the Napa Valley, celebrates its centennial anniversary in April, marking a century of serving Napa residents. Greene’s began when the late George Greene opened his doors in 1919. Greene sold the store to Glenn and Helen Paulsen in 1957. The storefront was moved to Jefferson Street during their ownership. The Paulsens retired in 1979 and sold the business to Peter and Terry Smith. During their ownership, the Smiths’ daughter, Laurie, worked at their Jefferson Street shop. She learned the business from the ground up. This is significant because when the Smiths were ready to retire, they approached Laurie and her husband, Alonso Corona, and asked the couple to buy them out. The Coronas did and have been working since to bring this hundred-year-old business firmly into the 21st century. Alonso is president and CEO of Greene’s Cleaners, Inc. and Laurie is CFO and in charge of accounting. When Greene opened his dry-cleaning doors in the early 20th century, Napa was a rough-and-tumble frontier town. The largest industrial companies were tanning factories that produced hides and tallow. Napa’s second largest business back then was wheat processing. Both were dirty businesses, which helped create the need for a commercial cleaner. During this time, farmers and factory workers would need to have their jeans, belts, boots, and saddles cleaned. Victorian era men dressed in suits. Women wore ruffled dresses. All were difficult to clean at home with just an iron. So the population started to turn to commercial cleaners. Into the next 100 years But Laurie and Alonso Corona are not resting on their laurels; they actively plan and implement new operations they hope will keep the business open and profitable for the next 100 years. “It was a natural move for us,” said Alonso. Greene’s also now services corporate accounts like hotels, B&Bs, wineries and restaurants. Greene’s commercial business specializes in guest room linens, event linens and large textiles such as drapes and rugs, as well as employee uniforms. Greene’s offers free pick-up and delivery, wedding gown cleaning and preservation, alterations, leather cleaning, area rug cleaning, and smoke damage and fire restoration cleaning. To help accommodate their pickup and delivery service into Sonoma, Greene’s Cleaners’ Jefferson Street location will stay in place and its Silverado Trail facility will be expanded. Today, Greene’s is the largest volume dry-cleaning and laundry company in Napa County and one of the biggest in Northern California. Greene’s operating process has also moved into the 21st century. Drivers use hand-held devices and apps to chart every stop they make and how long it takes. Cutting-edge computer systems track every single shirt, coat and dress and can pinpoint where every garment is located at any time during the cleaning process. This also drastically reduces the number of lost garments. This collection features recently-published business profiles featuring Napa County entrepreneurs.